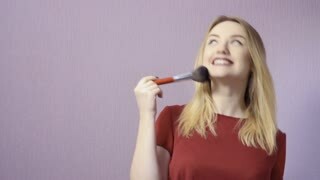 Cute shorthaired blonde girl looks at her collection of essential brushes for everyday makeup application. 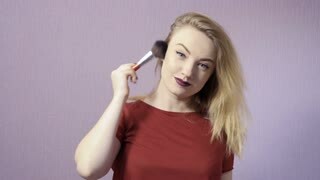 Attractivesmiling woman applying make up to her face with a brush looking at camera. Eye makeup. Female blonde makeup artist is busy applying professional eye shadows in her studio.